Good Morning & welcome to another FABULOUS Peachy Keen Challenge #43! This challenge is a sketch challenge! •Link to Mr. Linky before January 24th HERE! As with all of our sketch challenges, the basic layout should be there, but feel free to flip elements & get creative! For my card I used "Happy Lashes Face Asst" and "Snow Cuties Face Asst"! The sentiment I used is from my new stamp line & it's from "You Had Me at Chocolate"
The winner of the challenge will recieve this CUTE Peachy Stamp set! P.S. Don't forget about the giveaway HERE! Imagine Nation Monday Challenge HERE! This card is super cute. I love the things you come up with and I cant wait to get in my craft room and start working on something for this challenge!! Cute card Emma! Love the faces on the hearts and your pen work! Your card is too cute, Emma! I'm really enjoying your Gypsy videos all the more now that I finally have one! They've been so helpful!!! Emma I love this card! Red, white and black is one of my favorite color combos and the Bo Bunny paper is fabulous! EMMA, my friend, this is over the top ADORABLE!!!! I LOVE it! I got to get me some of that BoBunny paper! Oh, and I thought I heard you say at the Ustream that Peachy Keen was manufacturing your stamps, when you opened the case they looked pretty peachy. Did I hear right? They will be the best sentiment stamps on the market! Super cute card Emma!! Love that paper. Good for Nikki for enabling you to buy Lacy Lables. It's an awesome cart!! Really cute card. Love the colours. Your card is adorable, Emma! I love your Peachy faces! You make putting cards together look so easy! Can't wait to get my "You Had Me at Chocolate stamps!" Have a great day, my friend! How pretty, I loved it:) I am so going to have to try this card out, it's simple and cute and I would get to use my new peachy keen stamps:). Thanks for sharing Emma and as soon as I can I am so going to purchase ur stamps:). Emma, I just LOVE it. It's so sweet. You come up with the best ideas.."You Had Me at Chocolate" can't wait to get your stamps. your card is adorable as always I love the paper, will have to check out some BoBunny paper.Thanks for another awesome video, you are a great teacher. Emma...I love these colors! This card is just to cute!! best of luck on your new stamp set!!! Your projects are always so colorful! OMGosh Emma! This is the cutest card! Can't wait to get my hands on your stamps. What a great card, Emma! I love what you did with the sketch. And what a great new stamp too! You must be so excited to be using them. I'm looking forward to getting mine and using them too. I've already got lots of ideas!! ohhh sooo cute! I need to get my bum in gear and get to this challenge! Such a sweet card! Now you're making me want the Bo Bunny paper too! Stop it! great colors ! and the faces are too cute ! p.s. Thanks for your sweet comment on my Music Monday card!! I <3 Ray LM too! Emma, you've outdone yourself again! You come up with such innovative projects and I am so anxious to get your stamp set! Don't you just love hearts! Too cute! Hya Cricut Queen!!! I just ADORE this card! (Especially now I have my Cricut)! Love how you designed it and the video is SO helpful my friend. (I'm so in love my 'signed' DVDs too). You are a STAR!!! As always Emma, fantastic card, love the colors and the faces are adorable. Hi Emma!I know its been awhile :( Love the card very cute but no Polka Dots....jijiji Congrats on your new line of stamps so very cute. Emma! the card is perfect as usual! Love it! This card is perfect for Valentines day! I always admire your work! Amazing job like always! Cute card, perfect for Valentine's. I love your video's as you give so much info for those with and without your Gypsy girl. I don't have the Gypsy but I can use your info to do the same in Design Studio. 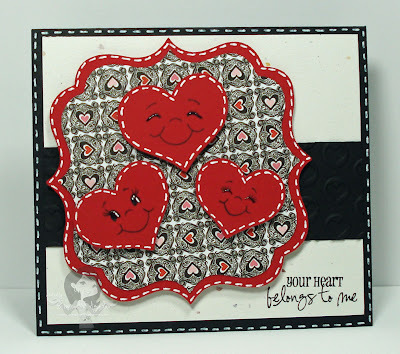 I so heart this card, such a cutie!